Each hair strand in the human body passes through four stages of growth: anagen, catagen, telogen and exogen. It is during the anagen, or growth phase, of the hair that laser, IPL or LHE permanent hair removal treatments can destroy hair at its roots and therefore prevent any new growth. Because not all hair strands are on the same stage, several laser and laser-like treatments are needed to ensure that each hair in the anagen stage is targeted. In laser clinics in Singapore, there are 3 methods of removing unwanted hair by use of light and heat energy. The first one is laser, which is a focused beam of light with a precise wavelength that can be customized to the specific skin tone and hair color of the patient. Intense Pulsed Light or IPL hair removal uses a more diffused light of different wavelengths that are ideal for treating more sensitive and fairer skin types. IPL is originally used to correct superficial flaws such as age spots and broken capillaries, with hair loss as an observable effect. Light and Heat Energy or LHE hair removal uses more heat than light to remove unwanted hair among patients with darker skin types. This is because the focused beam of laser may cause burning on Type V and VI skin, which contains more melanin than lighter skin shades. There are about 5 million hair follicles in the human body, and not all of them are at the same stage of hair growth. Men have more hair follicles than women (by a few hundred thousand), which is why they may need more treatments than women. The growing stage or the anagen is the best stage for a hair removal treatment. During the anagen stage, the hair strand is connected to the papilla, which in turn is connected to blood vessels that feed the hair and enable stem cells to grow into new hair. When a hair strand at the anagen stage receives IPL, laser or LHE treatment, the heat that is absorbed by the melanin in the hair is transmitted to the papilla. The absorption of heat by the papilla destroys the root of the hair and prevents any new growth. This makes the anagen phase ideal for permanent hair reduction by laser. The hair is rich in melanin, which enables it to absorb the maximum amount of heat from the device. Hair follicle shrinks and starts detaching from the papilla at the catagen phase. While you still can get laser hair removal treatments at this stage, the results are not going to be as effective because there is no longer a direct connection to the root of the hair. At this stage, hair growth stops completely. The hair strand has totally detached from the papilla, so laser hair removal treatments are not going to work at this stage. While in Exogen, the hair gradually loosens from the follicle and is eventually shed. 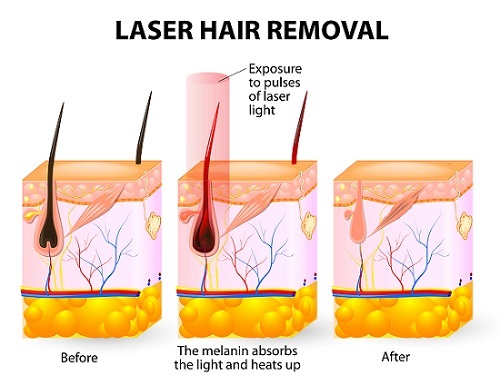 Patients getting permanent hair reduction treatments in aesthetic laser clinic in Singapore undergo careful evaluation by a skin care specialist to ensure that they are getting the most suitable laser hair removal treatment compatible with their skin tone and hair color.